Well, this post was never intended. With spring migration well under way, went birding (the feathered kind) today, walking from Sizewell up to RSPB Minsmere. A number of WW2 remains can be found along this section of coast, which have inspired the next couple of posts. Firstly in the dunes can be found this dugout - a picture is already on the website. Since my last visit to it however I have discovered Google Sketchup, so offer you this reconstructed cross section. 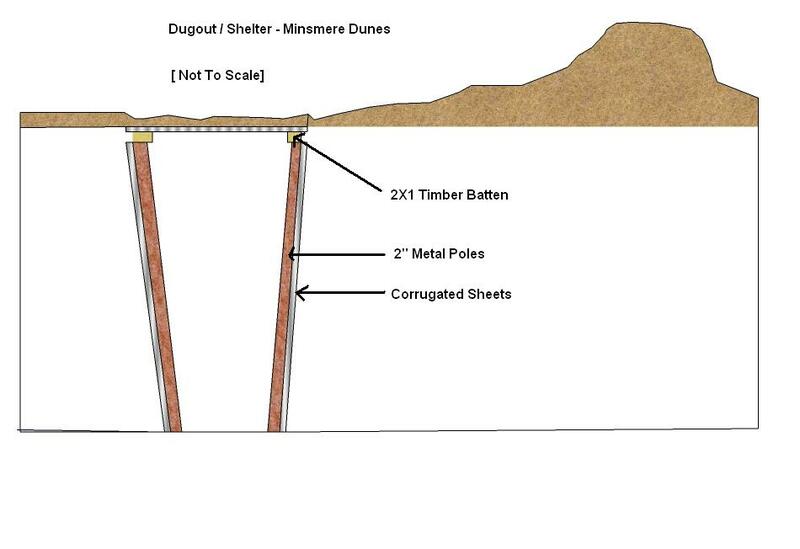 The dug out has been constructed by digging a trench and revetting the sides with corrugated sheets held in place with 2" poles. The roof seems to have been constructed with corrugated sheets nailed onto a 2X1 inch batten. If this is all it was it would not have supported sufficient material to be splinter proof and was probably only topped with sand for camouflage. The dug out was probably only used for cover against the weather or air attack, much in the same way as a slit trench. The spoil has been used to build a fairly high parapet in front, which would have added to the protection and would not have looked too much out of place within the dunes. In front of the parapet can be seen the remains of weapons-pits. Well, as always a good selection of birds to be seen at Minsmere but the only 'wildlife' photo I can offer is this quickly snapped picture of an Adder! Tomorrow hopefully some interesting Z1 naval scaffolding remains and a pic of the first ever .300 calibre bullet I've found (a few cartridges in the past, but never the bullet).